colleges girls humor humour women Advantages of being a girl. Advantages are Disadvantages are two roads, poles apart. When I say advantage, then there are select group that can come up with the disadvantages. Well that's the part of the game, my friend. 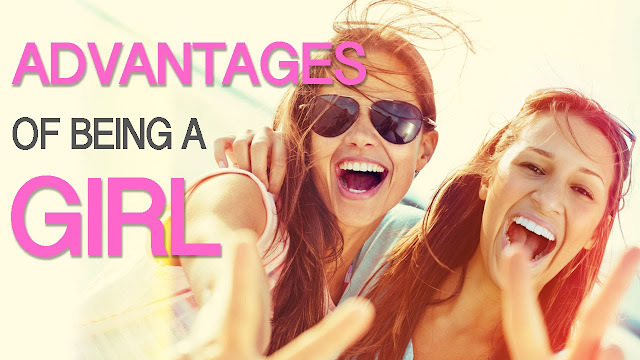 Today,lets discuss few advantages of being a girl. Women, never hate me after reading this blog post. This is supposed to be fun , okay! Right from the school days to the graduation and to office, girls have been treated with respect and honor has been bestowed upon them. Well, Well ,there are few exceptions to this. Few barbarians feature on the News channel for wrong reasons mostly for crimes against women. Lets not talk about the dark side in this article. It's completely fine that girls have been treated with respect and isn't it a good thing? But sometimes I feel I wish I were a girl. It's not that you get to travel in a train exclusively dedicated for women known as Ladies special or so! From my school days to my college days, I have seen many outstanding girls. Of course, Outstanding doesn't means that they are top performers. They mostly stand outside the classrooms chitchatting with friends and strolling outside with their boys. Thus, Outstanding! They do not attend lectures but some of them get their job done. Thanks to the boyfriends who can do anything to make them happy. Ah! Anything means anything. Even staying up whole night and writing assignments for them. I just walked down the memory lane to my Engineering days. But sometimes even the undeserving one's end up securing merit even after being an 'outstanding' student. Gods grace may be! And then the Sherlock Holmes and the Detective Byomkesh Bakshi in me discovered that it was not God's grace but the Professor's, the male one of course. Terms works comes handy when you mess up with your writing papers and it's these term works that the professors use as a tool to take revenge on the students. Yes, I messed up many times because of poor term works. These marks actually make a huge impact on your Engineering aggregate score. Hence, some sagacious saint from India rightly said that one should not take unwanted 'panga' with their prof's. Who knows they might take revenge on you? So instead develop a good rapport with the profs. But some girls take undue advantages of this. I am not exaggerating or generalizing here. Professors especially male professors are partial towards most of the girls. It was a research conducted by Professor Dhoble of Marathwada University in Maharashtra. The results of the research were startling to many but not me. I wish Prof. Dhoble visited our college. Most of the male professors are pretty rude to the boys. During Viva's he expects the male student to answer more within less duration. On the other hand, he expects the female student to answer less so that he could discuss many trivial things with her. I once caught my professor red handed asking the girls about her likes and interest areas. I have a solid proof to support my theory! Read on! Once I happened to enter a male professor's room when he was questioning a girl. He burst out at me and asked me to leave the lab as if I flirted with his girlfriend. The girl was giggling at me. I got exasperated at his behavior and attitude. Let me narrate you one such incident. 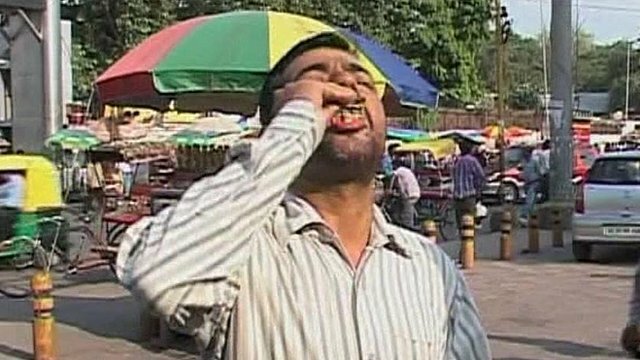 Have you ever seen a professor chewing tobacco during lectures. Yes, I've seen. This professor called Pringles (name changed for my security reason :P ), who chewed tobacco during our lectures. He was very famous among girls. His tongue would dance in red whenever he taught us something. Thanks to the Manikchand! That's the period of the day when the first benchers start loving the last benches just to prevent themselves from the red spray. Then after chewing tobacco he would go to smoke and return back after sometimes. He took utmost care to ensure that he is not caught while smoking. He followed some principles. He never allowed anyone to enter his class after 5 minutes. If so then he would treat them harshly. He would do an Admiral Aladeen to his students by throwing them out of his class. I was his victim once! Argrhh Nevertheless, he is kind by heart. I mean kind to lasses. How mean! Girls can enter his class at any given time. Obviously being a girl is quite advantageous as marks matter much. If we guys get 80% marks then girls could get 95%. After saying all this, I would like to emphasize on one topic. This would be an important one. We all know about a number of atrocities happening in our country. Crimes related to women are increasing day by day. There are various laws that are created to support women. This is to ensure that they are safeguarded from evil in form of prying eyes of the molesters and abusers. But it is disheartening to see that even some women make use of such laws to take revenge on men whom she hates. The recent Jasleen Kaur incident at Delhi is a perfect example of this. Even media fails to analyze the authenticity of the news and blindly targets and shames the guy. Biased! Similarly, sexual harassment laws at workplaces created at supporting female staffs and other laws are taken for granted. 'Some' women just make a mockery of something that is enacted to support and help them. Again NOT GENERALIZING. Such kind of revenge can damage someone's life, reputation, and career. It's advisable to think carefully before using such facilities and not blindly hit the bullseye! Everyone knows the story of the Sheperd and the Wolf! Don't we? Practice makes a man perfect..
:) that was funny, but elements of truth here n there :) cheers :) and as arjun said, take advantage.. thats the way we get excused of those exams too.. If you have such advantages, you have some disadvantages too...being raped by someone!!??? Scary eh...? one of my profs used to say "ponnunga aluthaalum marku... sirichalum marku..."
bitter truth ab girls....this is irrefutable !! You din miss a single point abt gals n Profs.. If there are 10 adavantages of being a girl!! There are 20 disadvantages of being a girl also :(..
u stare at gals the whole day or what??? or do u follow them around??? I hadn't came across such things as you posted,bcos i did automobile engg and there is not even a single girl in class(there were two but they seldom come to our class)! But i think being a girl should really be a nightmare..all seeing you,passing comments whenever you cross,you should be emotional,caring,always dressed,smiling,groomed,work with many physical problems,had to face abuse at least once a year(as statistics say),etc etc etc! Haha I have done project and completed many files of guys & girls during my engg. because I love writing and was willing to study even the mechanical engg subjects being a CSE student :P, I never saw any guy completing girls work. That being said yes girls do get advantages alot and attention and gets pampered. Nice prospective you have given here.